Most of us are familiar with the best spots to have Dim Sum in the Lower Mainland. From the high end such as Chef Tony and Red Star to the good value Western Lake, there are actually quite a few to chose from. However, there are a few relatively low-key places that can be considered neighbourhood favourites since most customers are regulars. Let's just say tourists would not have these on their list. One example is Lucky Dragon Palace on Victoria Drive. 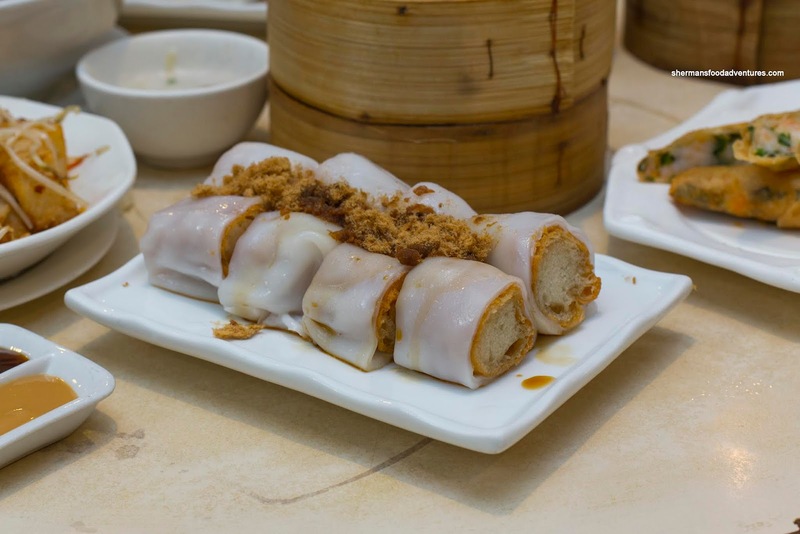 Formerly Hei Lum Mun, Lucky Dragon is as low-key as a place can get which was the perfect place for us to meetup with Goose for Dim Sum on Boxing Day. Since Goose, Mother Goose and my daughter were all under the weather, we felt a big bowl of Seafood Congee would be a good bet. Even though it was almost $15.00, the amount of well-executed ingredients justified the cost. 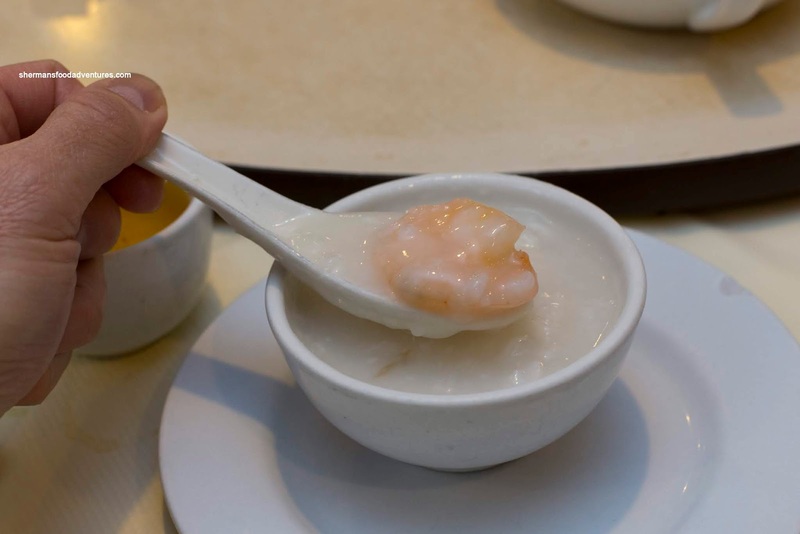 Nestled within the silky and mildly-seasoned congee, we found large meaty prawns, buttery scallops and tender basa. Every scoop from the large bowl yielded some form of seafood. Next, we had the XO Daikon Pudding Cake which was on the greasier side. Furthermore, the cubes were not as crispy as we would've liked. There was a nice spiciness from the XO sauce though and the accompanying bean sprouts were still crunchy. Taking a sharp departure from our usual choices for rice noodle rolls, we didn't have the shrimp, beef not BBQ pork. 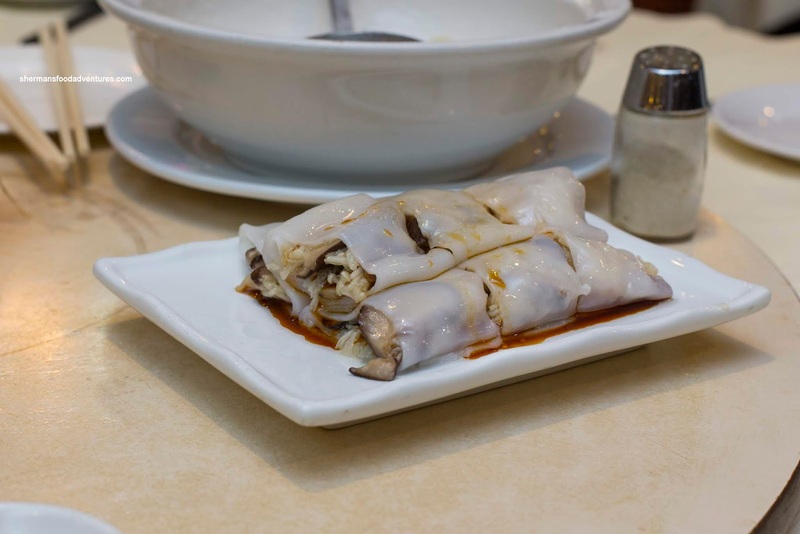 Rather, we got the Mushroom Rice Noodle Roll as per Mother Goose's request. Turns out she was on the right track as this was very good. It was overstuffed with various mushrooms including enoki (which gave it a certain meatiness and robust texture). 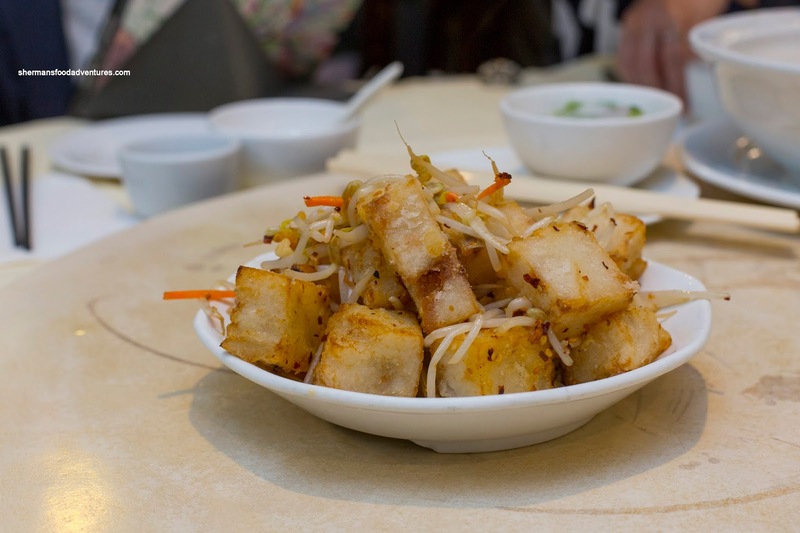 The rice noodle itself was soft and delicate with only a slight elasticity. Back to the regular, my son wanted the Donut Rice Noodle Roll and to his delight, it arrived without the dreaded green onions. Again, the rice noodle was on point, but the donut was too dense albeit crispy. A good amount of dried pork fluff topped the roll. Onto some meat, we got the Beef Meatballs which were a bit paler than what we are used to. They were fairly large in size <insert joke here> and mildly seasoned. They definitely needed the Worcestershire sauce on the side. 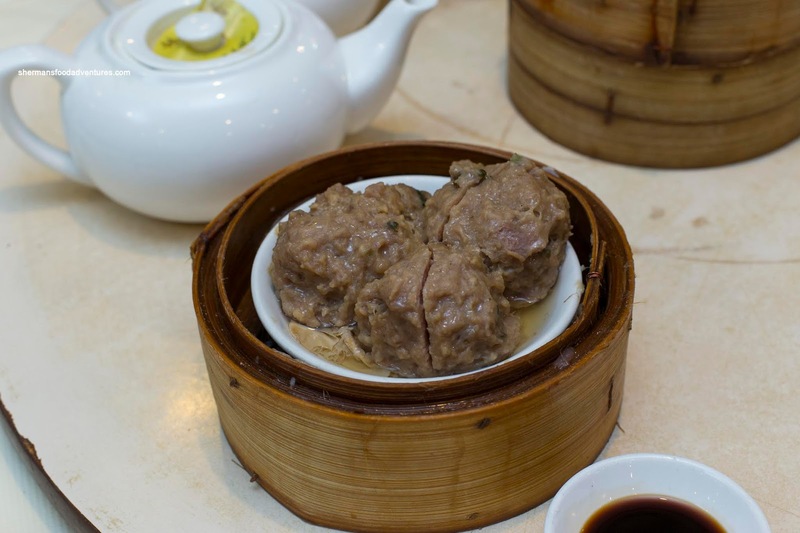 Although the meatballs were tender, the texture was too soft in our opinion. It was almost too airy where we didn't have much resistance when chewing. There was almost no rebound. One of my favourite dishes is the Bean Curd Skin Roll, so I decided to order it. Seems like it must be only me because most times, no one else really eats it. More for me I guess. This one was pretty good with a chewy fried bean skin. Inside, the pork filling was a little dense and a touch chewy. I would've liked to see it more moist and bouncy. 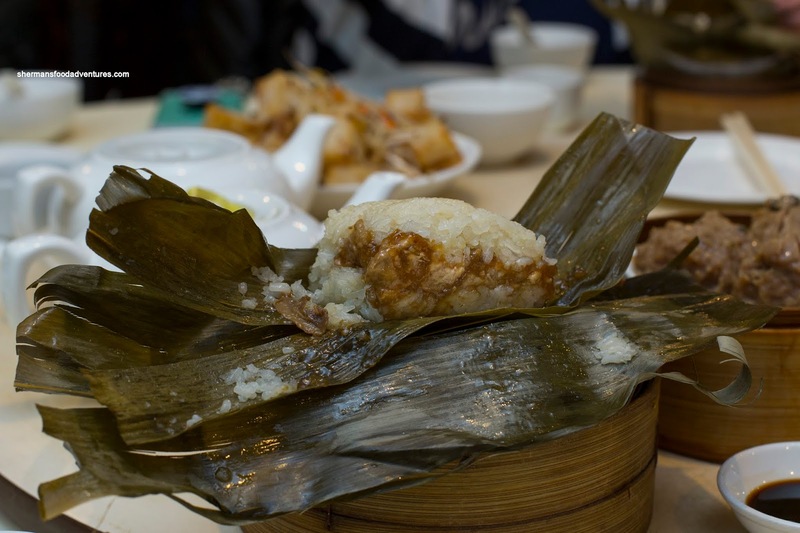 Probably the worst dish of our meal was the Lo Mei Gai (Sticky Rice). 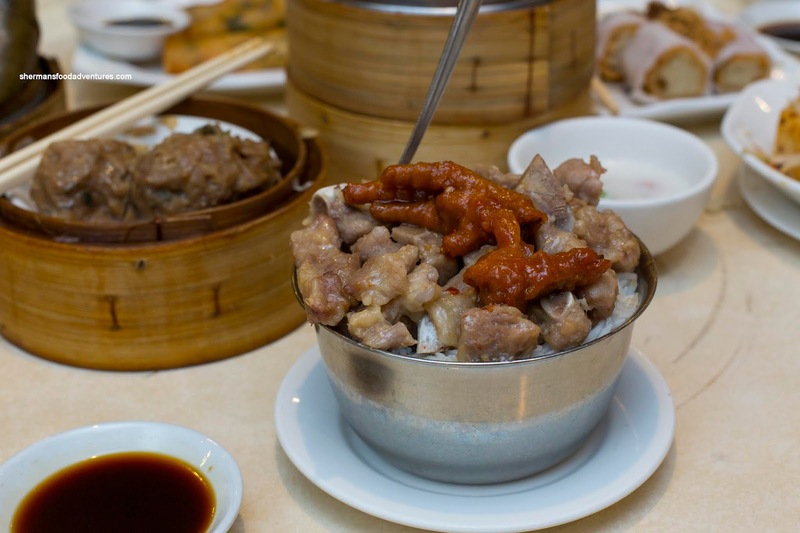 In actuality, there was nothing inherently wrong with the ingredients or the construction of the lo mei gai. There was plenty of lean ground pork within the sticky rice. However, the rice itself was pretty hard and dry. So the problem here was cooking execution where they needed to cooked this much longer before wrapping and/or after. Whatever the case, it wasn't good in the end. Staying with carbs, the Sparerib Rice was absolutely enormous in portion size. 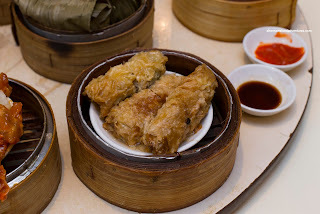 This was easily double the size of most other dim sum restaurants. In terms of execution, the spareribs were pretty good being meaty with a slight rebound. They could've been seasoned a bit more aggressively though. Underneath, the rice was chewy (in a good way), but a bit dense. 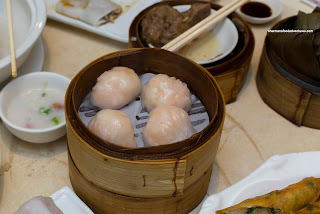 So onto the Dim Sum staples, we naturally ordered the Ha Gau and Siu Mai. 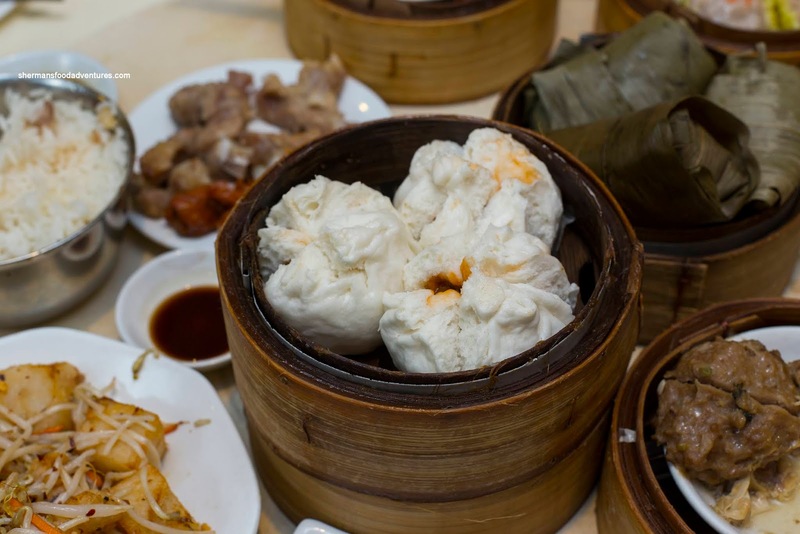 Fairly large in size, the ha gau featured a medium-thick dumpling skin that was was chewy with an appealing elasticity. Inside, the big pieces of shrimp were moist with a meaty snap. There was some sweetness to go with the natural aroma of the shrimp, but more sesame oil and white pepper would've helped. 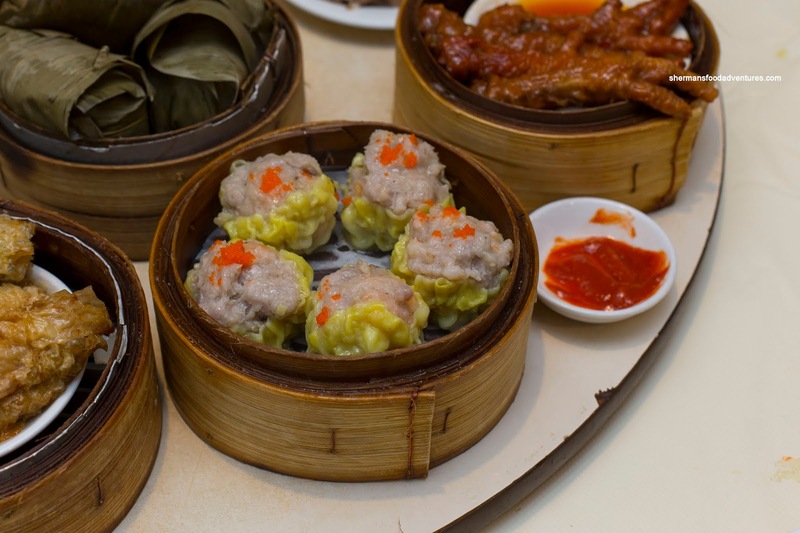 Large and served in a basket of 5, the Siu Mai were meaty and lean. There was some rebound, but I would've liked to see a more buttery texture from the pork. Also, there was a general lack of shiitake which would've helped vary the flavours more as the siu mai tasted mostly porky. 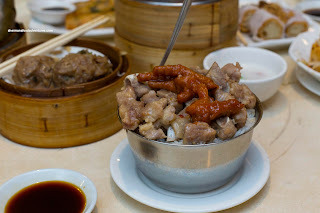 Whatever the case, this dish along with the sparerib rice, helped exemplify the portion sizes at Lucky Dragon Palace. 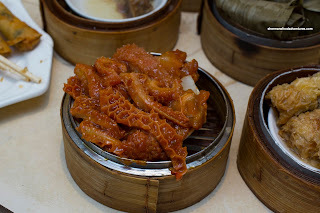 On that note, I was absolutely floored when the Steamed Honeycomb Tripe and Tendon was placed on the table. Beyond the 2 small pieces of daikon underneath, the whole dish was crammed full of tripe and tendon. Portion size is one thing, taste is another. Fortunately, this was both as the tripe was in large pieces being tender with an appealing chewiness. The tendon were also large in size retaining some texture while being soft. The dish was mostly sweet with hits of garlic. 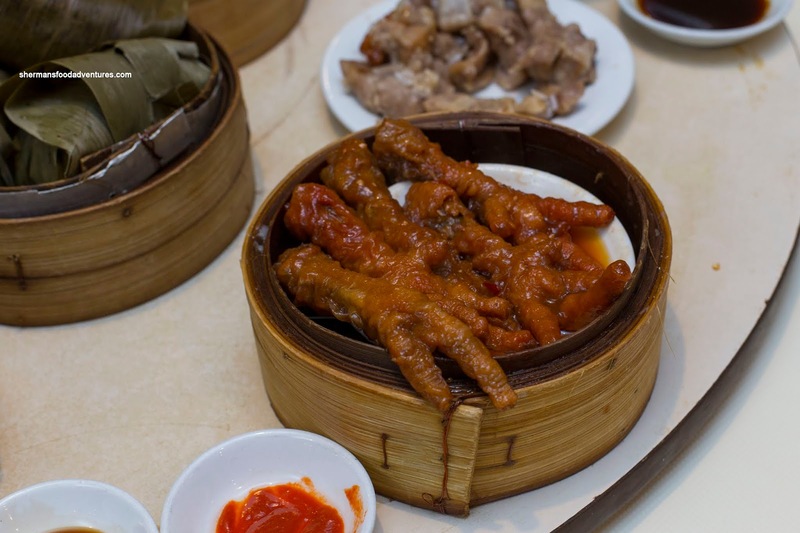 Exhibiting a similar flavour profile, but with a less goopy sauce, the Phoenix Talons (Chicken Feet) were pretty standard. Nothing particularly wrong with them as the cartilage underneath was soft while the fried skin was tender. They weren't as plump as I would've liked, yet as I said, pretty standard. Inundated with plenty of chives, my son avoided the Shrimp Spring Rolls like he needed to clean his room. Too bad really because they were actually good. Yes, I agree that it was overkill with the chives, but the shrimp itself was bouncy and well-seasoned. The roll itself was crunchy and not overly greasy either. Now, he did attack the BBQ Pork Buns because that is one of his favs. This was a pretty textbook version with a fluffy exterior giving way to a sweet centre. The pork was fairly lean and well-proportioned to the bun. 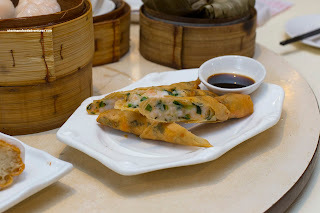 Overall, we thought that the Dim Sum at Lucky Dragon Palace was decent while the portion sizes were impressive. 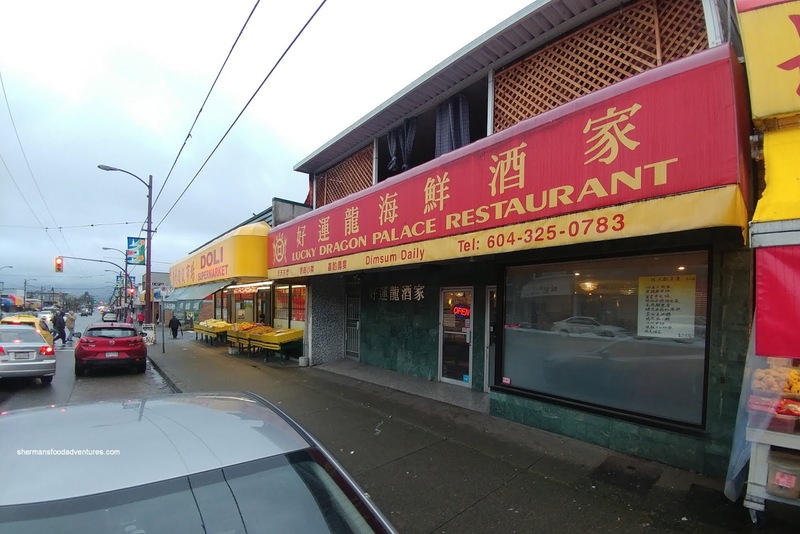 Considering the reasonable-pricing and surprisingly good service, this would be a good alternative to the rest of the spots along Victoria Drive (yes, including Western Lake) if you wanted something different and/or the wait is too long elsewhere.